Who will run your business? You have created an elaborate business plan, you have gathered the items needed, you have secured the funds from a no-doc loan – Are you running this all solo or are you getting a partner? A solid business partnership will allow your business to flourish. Not only will you have moral support, but when your partner is chosen wisely, your teamwork will create a balance to sustain a strong business foundation. Ideally, your partner’s strengths will be able to counteract your weaknesses and vice-versa. Take a look at one famously successful partnership, the glorious union of Steve Jobs and Steve Wozniak. Jobs was a visionary who could envision trends before they happened, while Wozniak had the technological intelligence to engineer these visions. Jobs was able to determine trends in the market in an almost psychic way, and Wozniak was able to find practical uses for his insight. Together the Dreamer (jobs) and the Realist (Wozniak) were able to work together to make their business a success that has transcended decades. You would think that Wozniak-and-Jobs-type partnerships come as easily as putting two people together, but it takes consideration, research and strategy to create your own “Dream Team”. There are several things to consider when choosing your business partner. Your business will be full of sensitive information, trade secrets and generally private data. You should be able to trust your partner without a shadow of a doubt, that they will be able to handle your information with care and discretion. Inevitably, obstacles are bound to arise in any business, creating an opportunity for conflict to develop between partners. Choosing a partner that you will help to navigate through rough patches with your partner, without worrying that it will impact your business. From Day One, you should lay everything out clearly and honestly with your business partner. Anticipate and identify any potential issues that you could possibly have within your business or with your partner and work together to find wise and strategic solutions ahead of time. Being able to pinpoint potential problems in advance will allow you reach a quick and clear-minded solution, should the obstacle arise. When forming your partnership, it is vital read any and all agreements. More than a simple read-through, make sure you take the time to fully understand everything that is being outlined. Ideally you will have chosen a trustworthy business partner, leaving you with slim-to-no reason to worry, however, it’s not personal – it’s business. 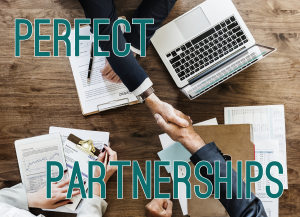 No matter how familiar you are with your partnership beforehand, or how greatly you trust them, you should never neglect to read the entire agreement prior to signing. Separate counsel is also a wise decision. Planning for the worst doesn’t translate into a lack of trust, it demonstrates a realistic and intelligent approach to business. In the event that a partnership turns sour, you should always seek to have individual representation to present your case. Finally, according to Entrepreneur.com, If you live in a community property state, have every business partner’s spouse sign the partnership/operating agreement and any amendments. The spouse presumably has an ownership interest in the business, and you want them to agree to the provisions of the partnership/operating agreement. This is especially important regarding the method of valuing the business when buying out a partner in the event of a divorce. Starting a business is an adventure, full of exciting events, so it’s important to plan appropriately and have everything in order. Whether you choose a sole proprietorship or a partnership , make certain to research all legal implications and proper structuring. Especially if you personally take out a business loan, make sure you are covered legally in all aspects. That being said, a good, strong partnership is a beautiful thing. It brings support and balance to a business when it is planned out. Take time your time when selecting a partner, and then enjoy the camaraderie along your exciting journey! It’s easy to think about the reasons why not, but your focus needs to be on reasons why you should! Every business starts with a dream. Something triggers a lightbulb, an epiphany. You start to map out all of the details of what you will need and where your business will go. Conversations with your friends are all about the details, and it’s everything you can think about – this is your passion. You have been dreaming about this concept for quite some time, and you feel that you are ready to make it happen! However, there are always obstacles, and funding is often one of the biggest. Where can you get it from? Will you be approved? What happens if you can’t get it? Consulting with the experts to find out if there is a way for you to be eligible for a business loan will answer these questions. It will help you navigate around many obstacles -in fact it allows you to set yourself up for success. 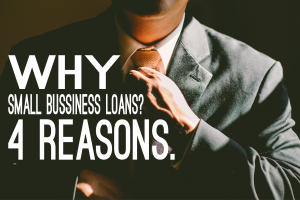 In case you haven’t thought about it already, let’s consider some of the greatest benefits of getting a business loan. You want to start out on the right foot, get all your ducks in order. Borrowing the funds to start your business allows you to purchase any equipment that you will need to run efficiently. This can include either technology in the form of computers or programs, basic office supplies such as paper, ink, and printers and of course a business space, furniture and even the aesthetic touches to cater your image to clients or customers. Having the funds available will allow you leeway to get things done right, from the start and purchase everything you need to get the show on the road! What’s the point of getting everything set up correctly, putting your time into designing and executing your business model and opening your doors, if people do not know about you? Marketing is essential throughout every part of the business progression – especially for brand new businesses. Marketing is bigger than just having a Facebook Page or Instagram – it includes creating branding elements such as logos, headers, websites, print materials and ultimately building your brand using continuous efforts which are refined over time. Once those marketing fundamentals are set, there are various opportunities to utilize ads on both digital and physical mediums. Of course to be done properly, all of this requires a vital investment. Stress is a killer. It can be a killer of productivity, patience, focus and dreams. Bringing all these pieces of your concept together is an important part of starting a business. It can often be a source of stress when you aren’t sure if you have the financial foundation available to you. Keep in mind that while you are setting up your business, you will also be supporting the basics of your lifestyle -rent, food, phone, gas, insurance, etc. Being able to support yourself and your new business properly without worry about whether you will be able to make the initial investments, frees your mind to focus on the next steps in growing your business. This is the bottom line: Dreams require a little magic to bring them into the waking world. Who says that magic can’t exist for you? Business loans allow you to experience some phenomenal things, and you will be able to watch as your little concept becomes a huge reality. There is nothing more surreal, or more satisfying than realizing you are capable of creating a successful business. However, we all need “a little help from our friends” to get the ball rolling. “Am I able to get a business loan?” -This is a very common worry that many new or potential business owners have. However, there is good news -you can often navigate around obstacles standing in the way of acquiring your loan. There are methods of getting start up loans without taxes or business plans, and loans for businesses who don’t show profit. Whatever your struggle is, we can offer a consultation to discover what is available to you! If you have good credit, there are great possibilities out there for you to take advantage of. So what are you waiting for? Make your dreams a reality! 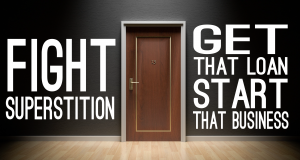 Fight Superstition – Get That Loan, Start That Business! Get that loan with Unsecured Finances! Black cats, ladders, salt, umbrellas, mirrors and the number 13… Oh my! According to a poll done by Gallup, 1 in 4 Americans are superstitious. This belief in supernatural causation tends to rise a great deal around Friday the 13th, bringing closeted believers out into the daylight. We see the effects of their beliefs in statistics across many industries by these individuals with “Paraskavedekatriaphobia”, or the fear of Friday 13th. The term, “superstition” is generally perceived to be a drastic loss in the luck department, but in actuality it is any belief that some supernatural powers would be attached to an item or action which would affect your luck in either an increased or decreased fashion. Find a penny on the ground, good luck. Smashing a mirror, bad luck. Both are examples of superstition. The reason that “Friday the 13th” is considered more unlucky than, say, “Monday the 13th” is a topic with many different theories, as outlined in the USA Today article, “Why Friday the 13th is Known as a Day of Bad Luck”. However, according to Huffington Post’s article, “Why Friday the 13th is a Very Lucky Day Indeed”, it is argued that the day used to hold a much different value as, “up until the patriarchal revolution, both Fridays and 13s were held in the very highest esteem. Both the day and the number were associated with the Great Goddesses, and therefore, regarded as the sacred essence of luck and good fortune.”. Could this good fortune be a truth that has been overlooked? Regardless of whether or not there are claims of bad luck tied with the day, what do statistics show? In an article on Business Insider called, “Here Are Your Not-So-Scary Friday the 13th Stock Market Stats”, Chris Adams is quoted on the positive influx the market has seen as an average throughout Friday the 13ths. He is quoted saying, “over the past 144 Friday the 13th days, the market has been up 81 times, averaging 0.6603% gain, the best being a 3.34% gain on Oct 13, 2000”. Yet another article on Market Watch, backs this information up with more noteworthy tales of positive stock market uptick. While many are avoiding participation in events such as the Lottery this Friday the 13th, there are some wonderful tales of immense winnings during the notorious day. Among these stories are players of the Michigan Mega Millions Lottery, who since 2003, have won more than $171 million in jackpots from drawings on Friday the 13th. Williams Rogers of L.A. County, California, certainly has a more positive outlook about Friday the 13th, with his $555,555 win a couple years back – and this isn’t the first time he has won on a Friday the 13th! You can even ask Daniel Huck of Waterloo what his perception is of the “unlucky day”. After his win last October, he and 7 others won $40,000 a piece! Traffic is notoriously low on Friday the 13th, due to the amount of people who stay home to avoid being in harm’s way. This in turn affects foot traffic through brick and mortar businesses, therefor affecting their sales. The good news is, if you want a shorter wait time in line at Starbucks, maybe braving the negative folklore and venturing out into the open will prove to be a lucky experience for you and a quick cup of joe. It really all comes down to perception. If you want to see something bad in a picture, you will identify characteristics that create what you are looking for, and the same goes for those who are looking for something positive. So while people are out there hiding from what they perceive to be potentially “bad luck”, take the opportunity to do something brave and make your own luck! Don’t let Friday the 13th be another reason for you to put off doing something that could change your life, be the success story to inspire others to do the same! So you have been wanting to start a business for a while now. You have the concept planned out, you have the location chosen, you know what supplies you need to build your foundation, and maybe you even have a few clients or customers chomping at the bit for you to open – what is stopping you? Don’t let this day be another excuse to put off your business, your dream. In fact, if you are looking to start a business and you have been running up against problems finding a loan, we can help you navigate to a lucky solution with working capital loans, home based business loans, non-SBA loans, unsecured no-doc loans – we can find out what will work best for you! We love working with businesses who have good credit, but keep finding themselves up against obstacles for obtaining their funds. Don’t waste another minute, let us make your Friday the 13th the luckiest day of your business adventure!